Mr. Richmond has experience in many areas of industrial hygiene, including anticipation, recognition, evaluation, prevention, and control of environmental factors arising in the workplace which may cause sickness, impaired health, or significant discomfort among occupants. He regularly performs investigations and makes recommendations for routine and complex asbestos, mold, bacteria impacts to structures and indoor air quality projects. Mr. Richmond brings with him thirteen (13) years of analytical laboratory experience, eight of which were spent as the Laboratory Manager for an Arizona state certified lab. 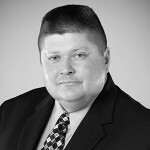 Mr. Richmond has an extensive background in asbestos consulting, including bulk sampling and asbestos oversight as well as six (6) years of experience with Maricopa County Air Quality Department where he worked as both an Asbestos NESHAP Inspector and Enforcement Officer handling issues of air quality non-compliance. Mr. Richmond brings over twenty (20) years of experience to MC Consultants, Inc.’s Environmental Division.